Most people know I am an iPhone lover. I’ve had an iPhone since about this time last year and I absolutely love it. This year I got even more hyped up about my phone’s potential awesomeness with the new App Store that Apple unveiled back in July. I had pretty much been waiting on it all year, even though my phone was jailbroken and had some 3rd party apps on it before then. Since the App Store came out I have probably flooded my phone with cool and exciting things. But it wasn’t all peachy and sweet. Before the ‘2.0’ software came out with the App Store the phone worked flawlessly. Hardly any bumps in the road and only a need of a reset from time to time. With the App Store came bugs, and lots of them. 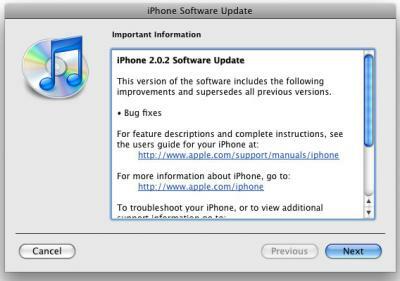 Apple has had two “bug fix” updates since July with more on the way. Its almost like the phone software went from stable and awesome to crazy and annoying. I love many of the features but day after day some bugs appear out of no where. Just today I read that there was a new security bug with the phone. Great! Just what we all need, people hacking out phones in midair. Apple is expected to patch it up once more just as they have always done. I just miss that stablity with this phone. It’s still the best thing I’ve ever bought for myself but the bugs get quite annoying from time to time. At least they don’t interupt my playing of de Blob!